How safe are pupils at your school when they are online? Ask most teachers this and they’d probably say, ‘Well, we have good filters in place and pupils have an e-safety lesson every year’. 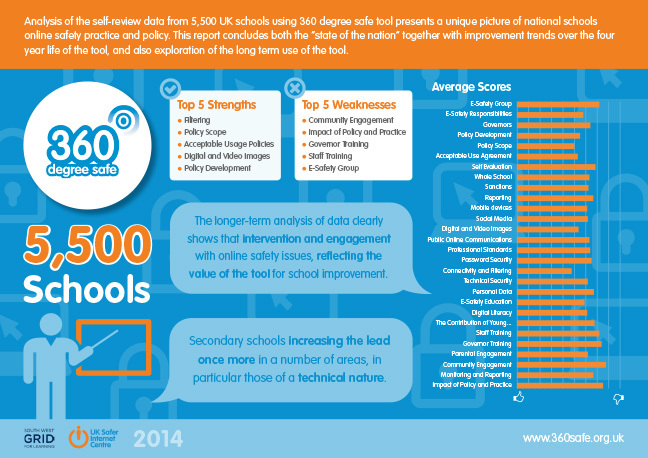 The reality is many that schools’ policies and practice are in need of improvement. The South West Grid for Learning (SWGfL) and Plymouth University recently published their annual assessment of the state of online safety in schools; UK Schools Online Safety, Policy and Practice Assessment 2014. At Telios we can provide consultancy to help you assess and improve e-safety, and training in e-safety for staff, parents and governors. And if you want external accreditation of the standard of e-safety we can help you gain the national e-safety kitemark, 360 Degree Safe. Contact us to discuss how we can help you make your school a safer place for pupils and staff.